Albert Einstein is often used as a synonym for genius. 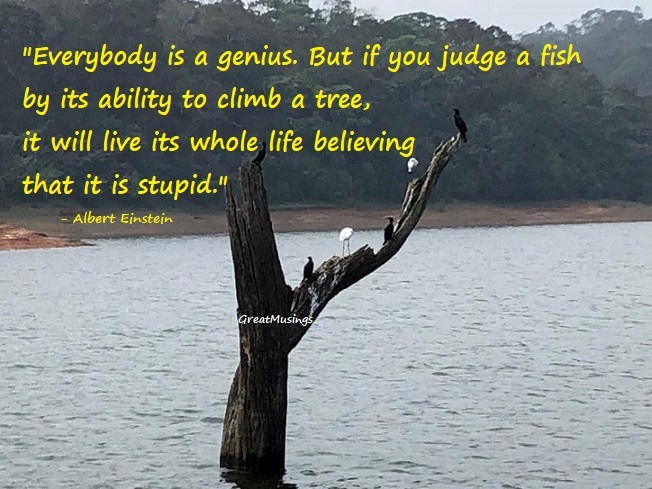 On an average, a person has IQ between 90-120 and IQ above 140 is considered as genius or near genius. Einstein had IQ above 160. After Einstein’s death, his brain was removed without the permission of his family. But later it was sent to various scientists around the world, to study the secrets of his intelligence. A part of Einstein’s brain is still on display in a Museum in Philadelphia, Pennsylvania. Einstein was born with a large head and had a speech difficulty during childhood. He even failed in the university entrance exam, scored exceptional marks in Maths and Science but could not clear other subjects. Einstein’s knack for Science and Mathematics made him the remarkable physicist. He published more than 300 scientific papers and more than 150 non-scientific works. He received numerous awards and honors including the Noble Prize in Physics. Everyone has a different ability. Don’t compare your abilities with others. You were born to be you. Discover yourself and focus on what you are good at.